Simple, affordable and clean attenuation! These PCB-style attenuators provide a simple and clean way of reducing your signal level wherever necessary. A simple 1-3dB attenuator between the exciter and final amplifier is often used to increase stability as the amplifier itself often represents a non-optimal load to the exciter (potentially causing oscillation or VSWR problems). A small attenuator brings the impedance closer to the expected 50 ohms. It can also be used when you have too much drive power for your amplifier, which can be fatal to many RF amplifiers. 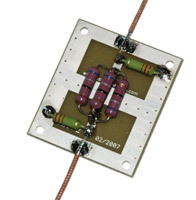 These attenuators contain several resistors arranged in a well-known PI configuration, mounted on an appropriately designed rectangular double-sided PCB. Four mounting holes are provided in the corners. Soldering pads are provided for input and output. We recommend teflon-based coaxial cable for internal wiring since teflon insulation does not melt when soldering. Input and output are interchangeable (it does not matter which one you select as output or input).